Copyright © 2017 Steve Shaw. All rights reserved. DATE OF EVENT Every Thursday. TIME 9:00 PM - 1:00 AM. Held at Yayo's Restaurant & Lounge, 36 5th Avenue (between Dean & Bergen Streets), downtown Brooklyn, NY 11217. Phone 718-622-8922. Web site www.YayosLatinCuisine.com . VIEW LOCATION MAP Click Here For Map. Travel instructions are below. PRESENTED BY Marcus Gonzalez & Jose Rivera of the Salsa Salsa Dance Studio, and Que Viva La Salsa Entertainment DJ John John . CONTACT INFO Salsa Salsa Dance Studio 718-602-1322. Marcus Gonzalez - Marcus404@gmail.com , Jose Rivera - JRivera1053@aol.com . Yayo's phone 718-622-8922. DJ John John - 718-290-3400. DJ John John's FaceBook Page. TYPE OF EVENT & VENUE Held in a long-standing Latin restaurant, Yayo's Latin Cuisine (formerly El Viejo Yayo) with a bar and club section downstairs. The salsa party is held downstairs where there are 2 rooms, one with a bar, one for salsa & the other for bachata. MUSIC Almost entirely pure classic salsa plus a little cha cha in one room, bachata & merengue in the other. DJ DJ John John plays in the salsa room. DJ Jun plays in the bachata room. There is also sometimes live Afro-Cuban percussion. BAND Occasionally. A band would be listed on our Main Calendar. There are usually live percussionists. DANCE FLOOR 2 rooms with approximately 2,000 sq. ft. - (1 of the rooms is 1,000 sq. ft. and the other is approximately 900 sq. ft.). 2). The floor is a resilient vinyl flooring that appears like wood covering both rooms. They are "medium speed". When there's high humidity, the floor can become a bit "slower". The dancing is downstairs in the Yayo Lounge . PRICES Regular admission price is $10 all night. On special nights, such as when there is a band, it may be more. Free admission for all NYPD, FDNY & military service men & women that show a valid ID of their past or present service. BEVERAGES AND FOOD Full bar plus kitchen open late for appetizers, bar food and full Latin meals. Bottle service available. See their Full Menu. Almost entirely "New York On 2" timing and style. DESCRIPTION Marcus Gonzalez & Jose Rivera of the Salsa Salsa Dance Studio invite all the mambo dancers to come and enjoy a Thursday night of salsa dancing at Yayo's Latin Cuisine (formerly El Viejo Yayo), a long-standing Latin restaurant and downstairs lounge that has been around for at least 30 years. 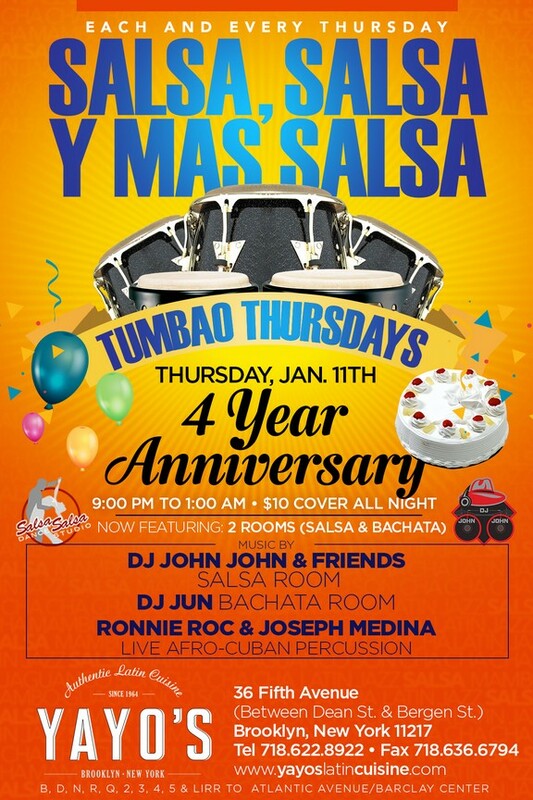 Plenty of classic salsa and more by DJ John John along with live drummers. Come for both dancing, socializing and eating. Yayo's has a complete menu of Latin food and a full bar. See their Full Menu. HOW TO GET THERE This weekly club salsa party is being held at Yayo's Latin Cuisine (formerly El Viejo Yayo), 36 5th Avenue (between Dean & Bergen Streets), downtown Brooklyn, NY 11217. Phone 718-622-8922. Web site www.YayosLatinCuisine.com. The salsa dance party is held downstairs in the lounge. Very convenient to get to by public transportation. Subways - B,D,Q,N,R,2,3,4,5 & LIRR to Atlantic Avenue-Barclays Center station. From Flatbush Avenues, walk about a block to Yayo's. For more information on public transportation, click on NYC Subway-Bus-Train Maps , or NY-NJ PATH Train Maps or Long Island Railroad Maps or MetroNorth Railroad Maps or HopStop. OTHER INFORMATION No age requirements for entrance to the restaurant and dancing area, but ID showing age 21 is required to order liquor from the bar. Please Note: Since commercial clubs have high expenses and need to make a profit in order to stay open and continue playing lots of salsa, they will therefore cater to the customers who spend the most money at the bar. Mambo dancers can help get what they want by spending more money for drinks at the bar, even if it's sodas, fruit juices, virgin cocktails, water, sports drinks. You may think you're smart by not buying anything at a club, or sneaking in a bottle of water or liquor, but actually you are pushing them to cater to other customers who will spend more at the bar. Those are the customers who want to hear other kinds of music instead of salsa. If you want commercial clubs to feature more salsa nights, you have to pay for it by purchasing beverages at the bar. This is just simple economics. www.SalsaNewYork.com is not affiliated with any events or clubs; we are just being realistic. Special thanks to salsero Amir Shimoni for design and technical help in the creation of these events pages. See his web site www.MamboPics.com for photographs of the people, events and performers of the New York & New Jersey mambo scene. All correspondence regarding this web page should be directed to co-host/webmaster Steve Shaw.